Feminist-Art Icon Under Her Umbrella-Ella-Ella: Robin Cembalest writes for ARTnews about Carolee Schneemann’s (AP Mentor) work at Art Basel Miami Beach. In making the film itself a virtual consciousness, Nitoslawska and her team help us experience Schneemann’s profound difference as both an artist and a woman of her generation. Whereas many other groundbreaking artists around her looked to experimentation and theory as discrete elements and processes in the formation of their ideas and art, Schneemann seems to merge with phenomena and mind as organic wholes not to be broken down, but rather to be refashioned into new intertwining ways of experiencing them. 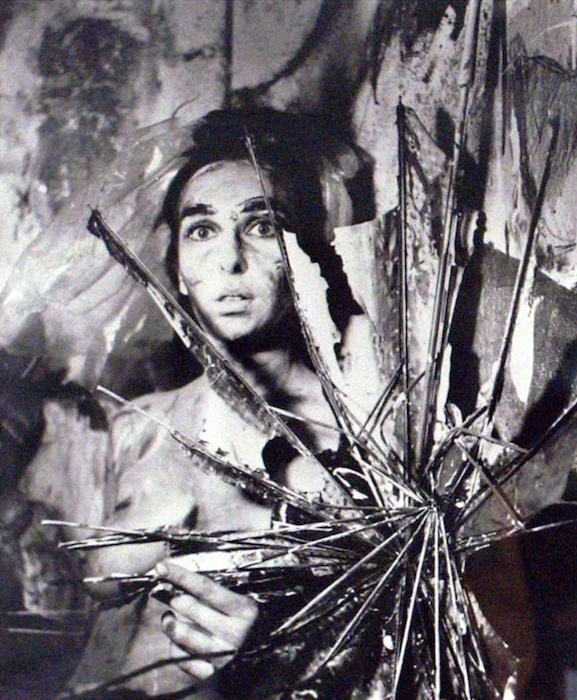 G. Roger Denson writes for the Huffington Post about Breaking the Frame, a film by Marielle Nitoslawska about the art and life of Carolee Schneemann (AP Mentor). Carolee Schneemann (AP Mentor), “SNAFU,” 2004. Motorized sculpture with projection. Courtesy of the artist. Thyrza Goodeve (AP Faculty member) interviews Carolee Schneemann and Heide Hatry for the Brooklyn Rail.